All the popular activities in West Maui are just steps from the front door of your Lahaina Shores Beach Resort condo rental. 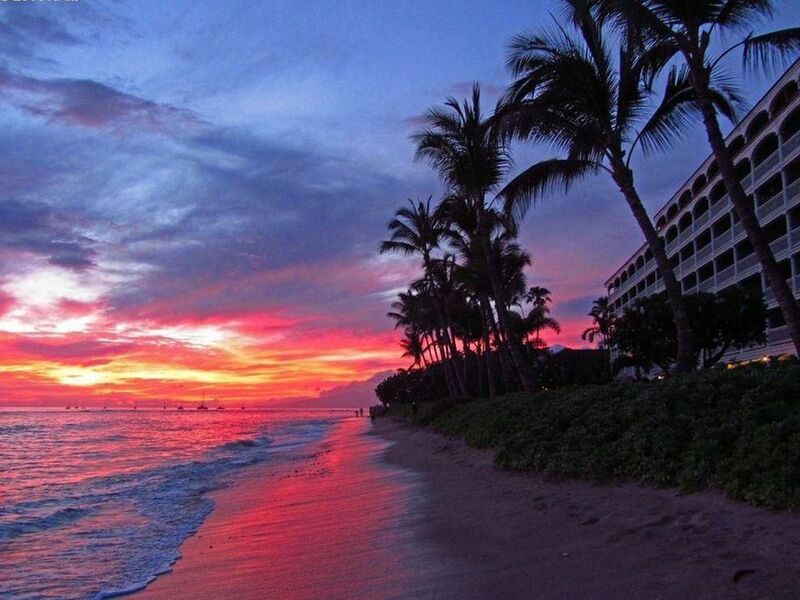 The vacation of a lifetime starts when you discover the golden sands directly out in front of your Maui condo and historic Lahaina Town is just steps away. The condo is on the 6th floor which is a high ceilinged Studio with unobstructed mountain and valley views and from above the palm trees from your private lanai. Watch the sun rise over the mountains while enjoying coffee on your private lanai. Or, you can leave the blinds open when you go to sleep and watch the sunrise from bed. It’s all good in laid back Maui. There are numerous great restaurants within easy walking distance, and the office gives you a key to a private entrance into 505 Front Street Shops and Restaurants. Or you can go to the local farmers market and store to make your own means in your full kitchen. The resort grounds are easy to relax in on the manicured grounds near the pool and watch the sunset over the ocean. Make a tropical drink in a plastic glass, and sit on the grass or beach enjoying the surroundings and listening to the waves. Washers and dryers are available on each floor. This is a non-smoking resort. A smoking area is provided at the southeast corner of the property. Local hourly bus service is available a few blocks away. There is a concierge in the lobby area to assist in your daily plans. Remy is extremely friendly and helpful. The friendly guest services staff offers knowledgeable advice, great rates, and reservations for all Maui activities from luaus and dinner cruises to bicycle adventures and helicopter tours. Dinner reservations and babysitting are also easily arranged. Hours from 8 a.m. - 5 p.m.
Lahaina Shores Beach Resort features a freshwater swimming pool, whirlpool spa and immediate access to one of Lahaina's best beaches for snorkeling, wading or sunbathing. All of these Maui activities are available right outside your door. Pool and whirlpool spa hours are 9am - 9pm. Complimentary pool towels are available at the front desk. Enjoy Maui's relaxing lifestyle and watch the golden Lahaina sunsets while grilling your favorite Island fish or steaks. Lahaina Shores Beach Resort has two poolside, barbeque gas grills available for your enjoyment. Rates vary by date - please check the rates section. (Rate is based on 2 guests.) Inquire for your dates and please check my calendar for availability. Resort quality at half the price. Manicured grounds, meticulously maintained pool and spa. Relax in the plantation style lobby or enjoy the quiet of your room which has the same plantation theme. No daily maid service, exit cleaning only. Stays longer than 7 days will be charged an additional towel and sheets fee. You could not ask for a better combination of amenities and location in Lahaina Town than Lahaina Shores Beach Resort. You will fell that you are in a 1st Class Hotel. The property is a few feet from the lengthy beach stretching from Lahaina Harbor to Puamana Subdivision. You do not need a car unless you plan on driving upcountry or to Hana and even then public transportation will allow you to access major portions of Maui. The Bus stops next door at the 505 Front St. connecting you to all other buses that will take you allover. Within walking distance there are numerous shops up and down Front Street. Next door at 505 Front St. you will find shops and restaurants. Just 2 blocks away is the World famous Banyan tree park that hosts entertainment and local artists display their wares on a weekly basis. The friendly front desk staff will greet you and assist you along with the concierge desk operated by Expedia to provide you with information and opportunities to engage in activities all over the island. The front desk is open 24/7 and parking is available payable to the front desk currently at the low price of $3.50 a day.